For my Crepe Tea Party I served savory and sweet crepes. Last year for my French Tea Party I made savory crepes and they tasted great, but I had such a hard time flipping them. 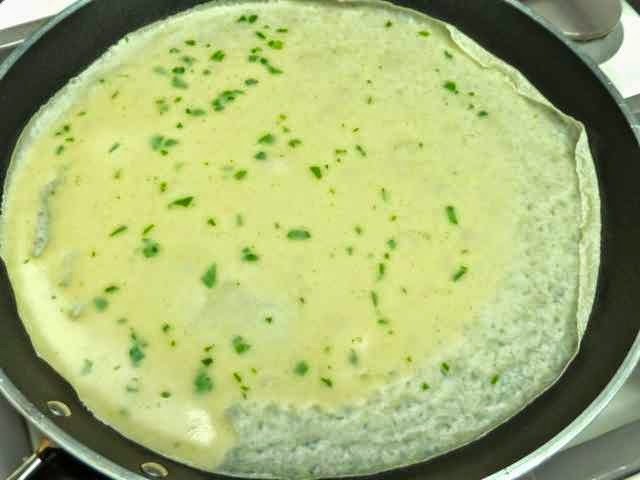 This is a new recipe for Savory Crepes. These crepes are delicious, thin, pliable and so easy to work with. 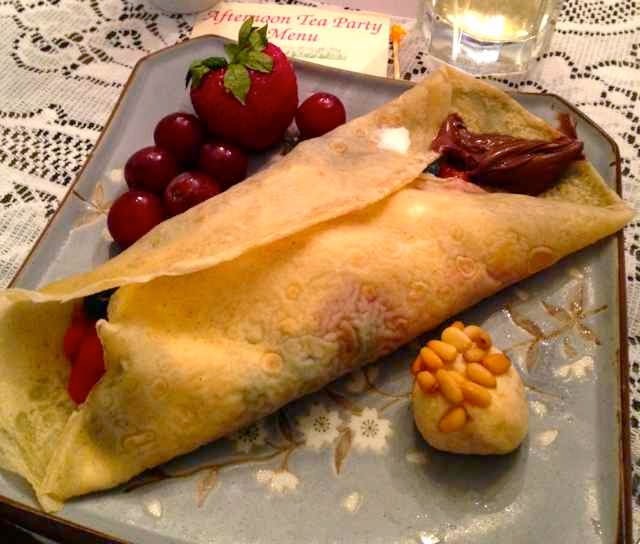 I used the same basic recipe for both the savory and sweet crepes at this Tea Party. For the savory crepes I added fresh herbs and with the sweet crepes I added some sugar to the batter. Another exciting thing about this crepe recipe is that no xanthan gum or guar gum is necessary. Truthfully, I forgot to add some when I converted the wheat recipe into a gluten free one. I began to cook them before I realized my omission. Then, since they were staying together very well without using any gums, I just left it out all together. Happy accident. You can make these several days ahead, keep them in the fridge and then just heat them up before serving. You can also freeze them for use more than three days later. I used a deli type paper between each crepe to keep them from sticking together. I wrapped the pile of crepes in foil and heated them up in a low 200° oven before serving. At the Tea Party the crepes were kept warm, still covered in the foil, on a hot plate. Guests opened the foil, removed a crepe and recovered them with the foil. This worked very well, the crepes stayed warm, they did not dry out and were just the right texture. Crepes, wrapped in foil, keeping warm on a hot plate set to the lowest heat setting. 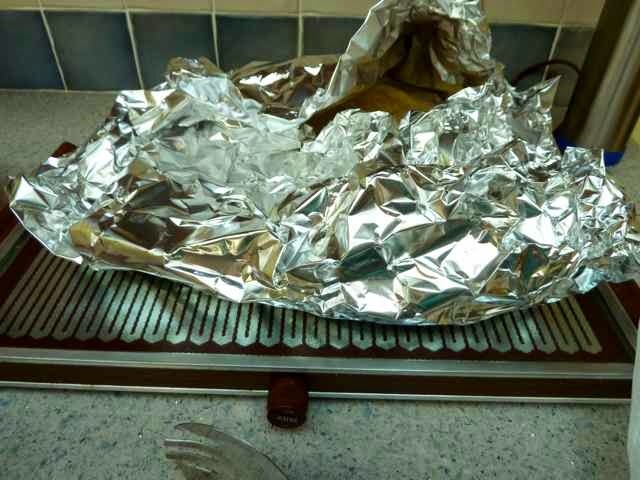 Guests opened the foil, removed a crepe and then closed the foil to keep them warm. I set up serving stations for the savory crepes first. I forgot to take photos. I get so involved in serving (and eating) that I forget all about capturing the moment in a photo. I kept the fillings warm on a warming tray with covered dishes. The fillings included cheese sauces (dairy and non dairy), sautéed mixed vegetables and mushrooms. I also served some summery canapés and a salad. 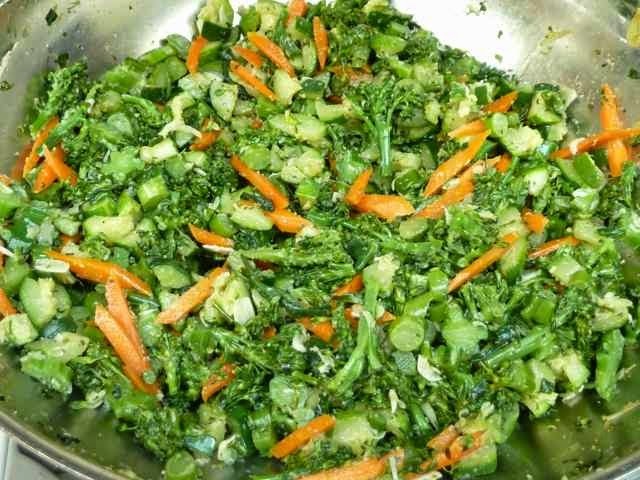 (broccoli, zucchini, garlic, carrots and some herbs). 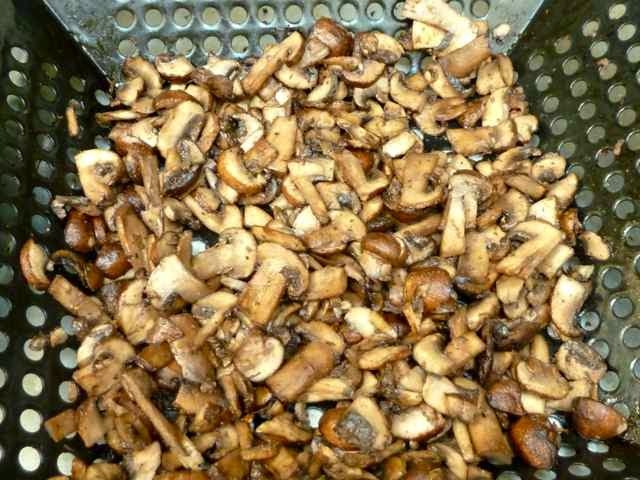 Mushrooms with garlic for filling savory crepes. These were cooked outside on the grill. 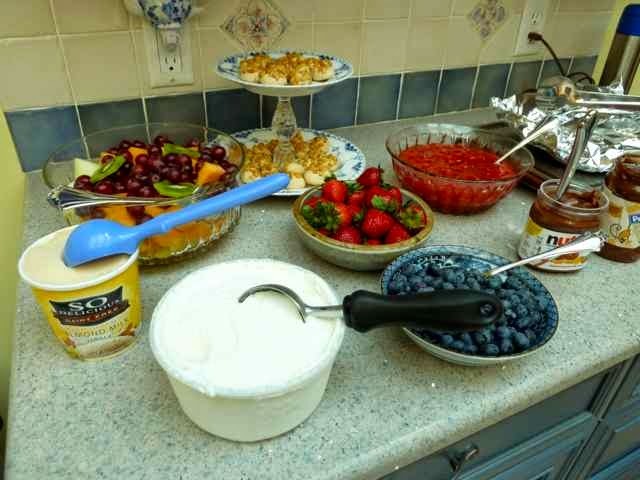 The dessert station, that I remembered to take a photo of, included fresh fruit, ice cream (dairy and non dairy), homemade strawberry sauce, Nutella and chocolate peanut butter. I also served some Pignoli cookies. I made enough so that each guest could have two or three of each kind of crepe. I froze the leftovers, well wrapped in plastic. Only two of us must eat gluten free, but all the guests loved the crepes and praised the taste and texture. I love Tea Parties! Add the flours and salt to a bowl and mix well with a whisk. Set aside. Add the eggs and milk or water to a blender or large bowl. Blend or whisk until well mixed. Add the flour mixture to the liquids in the blender or bowl. Blend or whisk together until smooth. Savory batter. It should be very thin. Scrape down the sides of the blender if needed. My crepe cooking set up. (one set to 90 seconds for first side and one set to 60 seconds for the flip side). Heat a 7, 8 or 9-inch crepe pan or non stick skillet over medium low flame. Grease the pan with butter, oil or margarine. Do not allow the pan to smoke or to brown the grease. Pour ¼ cup of the batter onto the hot pan. Tilt the pan and swirl the batter so that the batter spreads evenly over the bottom of the pan. You can patch holes with drops of batter if needed. The crepes should be about ⅛-inch thick. Cook on the first side about 60-90 seconds or until the top is dry and the bottom is lightly browned. Flip the crepes and cook about 60 seconds on the second side or until lightly browned. I used my fingers to flip the crepes. You can also use tongs or what ever works for you. 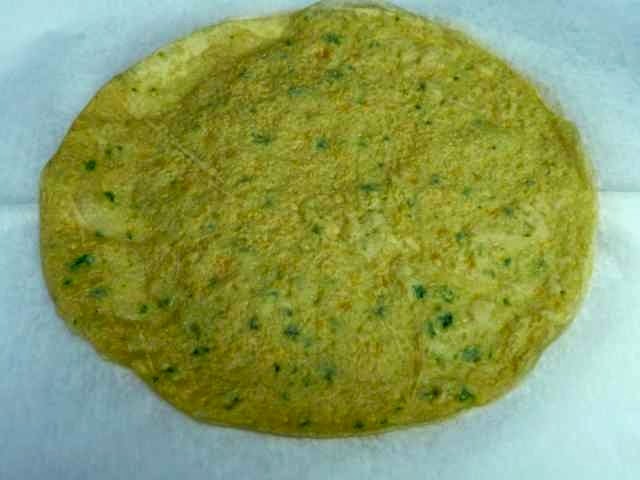 Slide or flip the crepe onto a piece of deli paper or parchment paper, or foil. Repeat with the remaining batter. 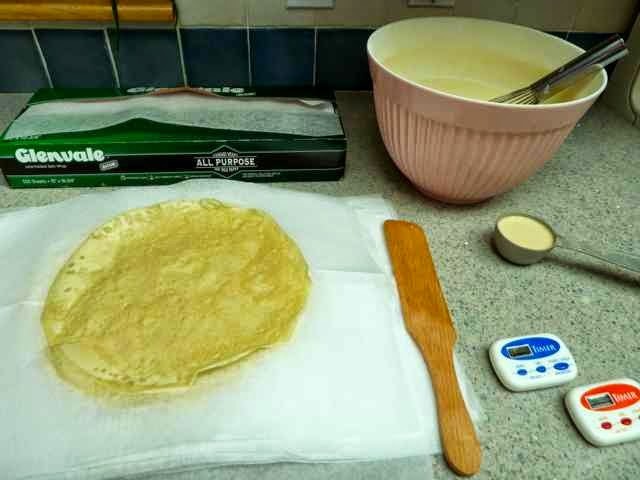 Separate the crepes between pieces of deli or parchment paper or foil so that they do not stick to each other and can also be reheated in the oven. Add the flours, sugar and salt to a bowl and mix well with a whisk. Set aside. Next follow the instructions #2-#9 for the Savory Crepes above. 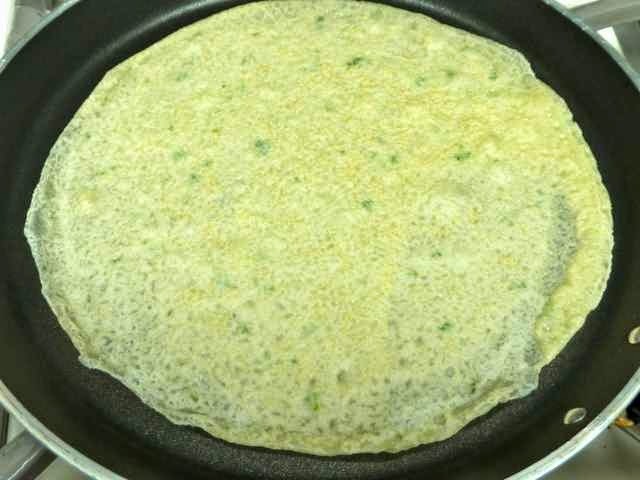 GLUTEN FREE SAVORY CREPES Makes about 16 Ingredients 1¼ cup Tapioca Flour ½ cup White Rice Flour - Superfine Ground (or Sweet Rice Flour) ¼ cup Sorghum Flour ¼ tsp. Sea Salt 4 large Eggs 2 cup Water or Milk (I used almond milk.) Directions SAVORY CREPES Add the flours and salt to a bowl and mix well with a whisk. Set aside. Add the eggs and milk or water to a blender or large bowl. 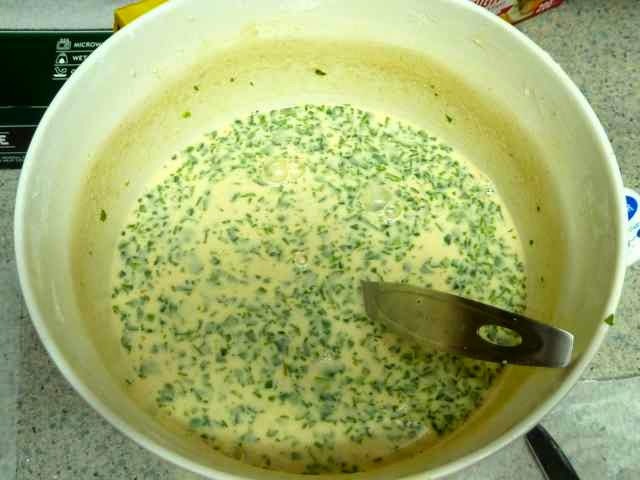 Blend or whisk until well mixed. Add the flour mixture to the liquids in the blender or bowl. Blend or whisk together until smooth. Scrape down the sides of the blender if needed. Heat a 7, 8 or 9-inch crepe pan or non stick skillet over medium low flame. Grease the pan with butter, oil or margarine. Do not allow the pan to smoke or to brown the grease. Pour ¼ cup of the batter onto the hot pan. Tilt the pan and swirl the batter so that the batter spreads evenly over the bottom of the pan. You can patch holes with drops of batter if needed. The crepes should be about ⅛-inch thick. Cook on the first side about 60-90 seconds or until the top is dry and the bottom is lightly browned. Flip the crepes and cook about 60 seconds on the second side or until lightly browned. I used my fingers to flip the crepes. You can also use tongs or what ever works for you. Slide or flip the crepe onto a piece of deli paper or parchment paper, or foil. Repeat with the remaining batter. 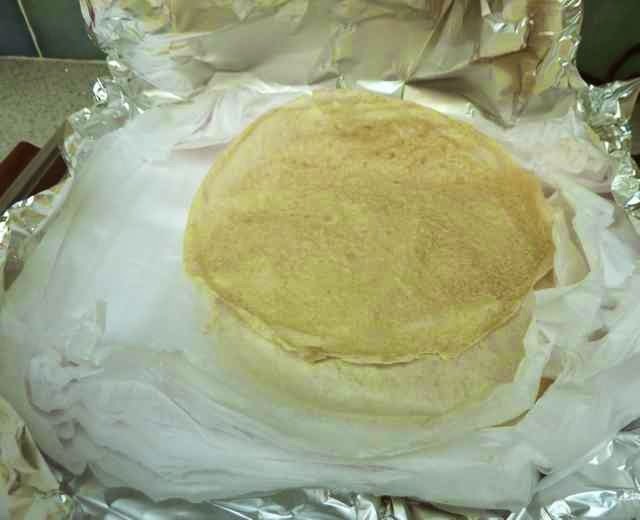 Separate the crepes between pieces of deli or parchment paper or foil so that they do not stick to each other and can also be reheated in the oven. 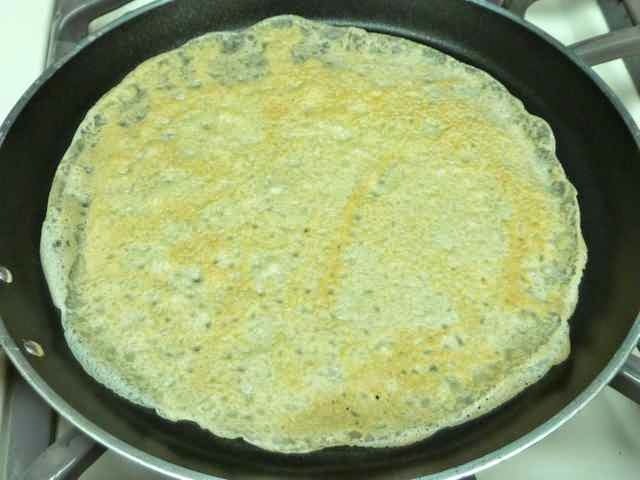 GLUTEN FREE SWEET CREPES Makes about 16 Ingredients 1¼ cup Tapioca Flour ½ cup White Rice Flour - Superfine Ground (or Sweet Rice Flour) ¼ cup Sorghum Flour ¼ cup Sugar ¼ tsp. Sea Salt 4 large Eggs 2 cup Water or Milk (I used almond milk.) Directions SWEET CREPES Add the flours, sugar and salt to a bowl and mix well with a whisk. Set aside. Next follow the instructions #2-#9 for the Savory Crepes above.